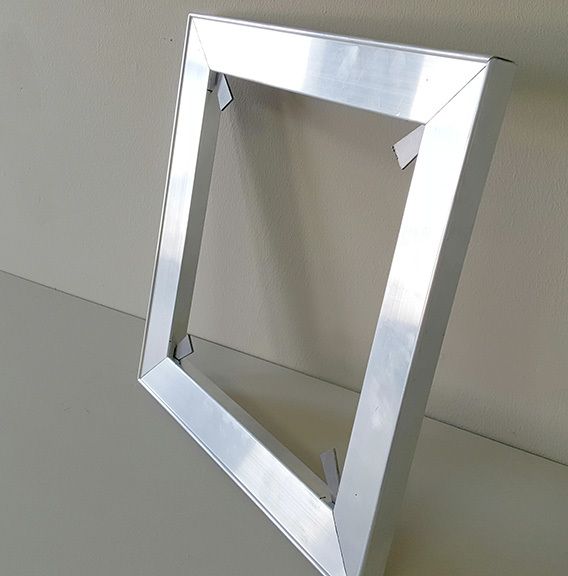 Aluminium Stretcher frames (Stretchers manufactured from Aluminium alloy) has become increasingly popular with artists wanting an extremely robust and resilient frame. Aluminium as a support frame, is enjoying increasing popularity in America and Europe; the strength of aluminium allows for the manufacture of large canvases that need to remain on a slender support structure, without possibly bending. Aluminium also finds advantage where artworks will be susceptible to harsh environmental factors, such as moisture or direct sunlight. Given that little timber is used in the construction of the frame, artworks in outdoor environments will also be safe-guarded against insect or wood-borer infestation. A first in Southern Africa, Winsen’s Canvases designed their own in-house extrusion, very similar in shape and form to that of its timber counterpart. A thin timber section is inserted into the profile, allowing for the back-stapling of any canvas type or original artwork. As with timber stretcher frames, the aluminium profile accepts keyed metal wedges, allowing for the expansion of the stretcher. Robust and clean, canvas stretched over an aluminium stretcher is guaranteed to remain straight and stable, no matter the size and environment. Aluminium Stretcher frames depths are available as 25,50, 75 and 100mm deep. All stretchers are supplied with steel expansion wedges, allowing the frame to be expanded when necessary.